Call him the real Clark Kent. By day, Duke Castiglione is a mild mannered reporter. And much like his DC Comics counterpart, you'd never be able to guess that underneath the suit and tie lies an insanely ripped, athletic physique. Yes, it turns out that the sports anchor for Fox 5 NY's No. 1 morning show, Good Day NY, might also be the fittest man on television. Think otherwise? Join the conversation on social media with the hashtag, #TVsFittest. In the meantime, check out our exclusive interview with Duke, below. M&F: You’re super-ripped now, but you say you were overweight in high school. Castiglione: Yeah, I was 16 years old, and I weighed 226 pounds as a junior. I was picked on a little bit, but I was still playing sports. I picked up Muscle & Fitness that winter, and it helped a lot. I started going to the gym to get ready for baseball season, and by the following summer I had lost a bunch of weight. It was an inspiration. In many ways it taught me to work out. That and Sports Illustrated were my two favorite magazines. M&F: Working in TV can be incredibly stressful. How do you make time for the gym? When it comes to working and working out, the discipline and concentration that training requires go hand in hand. When I’m working out, my work is better. Everyone can make the time. You can get up earlier. You don’t have to go out at night. When I hear that people don’t have time to go to the gym, that’s nonsense. If it’s important to you, then make that time. Even if it’s just a half hour a day. When you look better, you feel better—and then you perform better. M&F: You’ve trained on air with Phil Heath, Robert Irvine, Mike O’Hearn...Who has the best advice? They’re all great guys with interesting stories. I think the viewers like the tips they bring. They know so much—and they’re successful not just in fitness but outside of it as well. That’s not an accident. I loved what Chef Irvine said about ordering food when you’re out. Here’s a guy who’s on the road 300 days a year and says to place custom orders not on the menu. If a restaurant doesn’t have grilled chicken on the menu, just ask for it. They’ll probably make it. M&F: You’ve been covering sports in New York since 2000. What are the most rewarding stories you’ve worked on? The big events are always great, of course—Super Bowls, World Series. But human interest stories, the stories people might not have heard about, are the most rewarding. I really enjoy every aspect of it. No two days are ever the same in New York. It sounds like a cliché, but if you love what you do, you’re not really working, and I love what I do. M&F: If you didn’t train or play sports, do you think it would be harder to do your job? It definitely helps that I played—not that I played well—but it gave me a lot of respect for what it means to compete at such a high level, because I couldn’t. Training helps, too—it’s something else to talk about with athletes. Mark Teixeira, Jon Beason, Steve Weatherford, especially—those guys love to talk about their workouts. 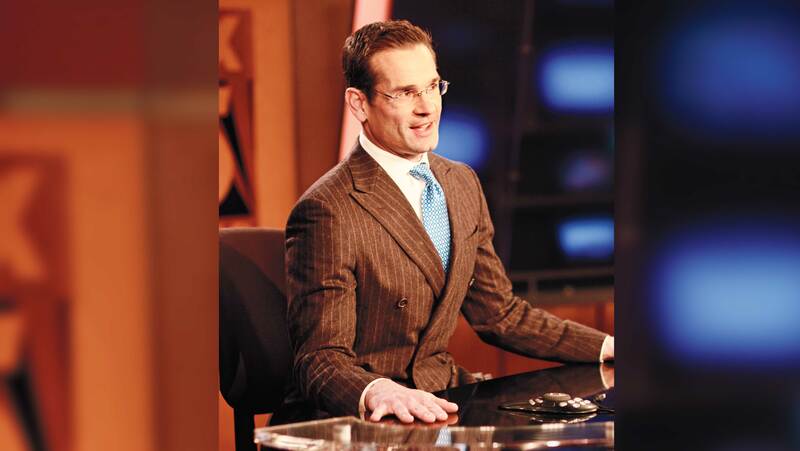 M&F: Good Day NY co-host Greg Kelly called you scrawny. What do you think he’ll say when he sees this? [Laughs] I think he’s very happy for me. All my co-workers are excited. [Weatherman] Mike Woods has been in M&F [in 2003]. We’re all legitimate fans of the magazine. M&F: What’s the best piece of training advice you ever got? What works for someone else might not work for me. How many sets you need to do, how many days you need to train, how much rest you need—all of that is highly individual, and that’s the part you need to figure out on your own. When I was getting ready for the shoot, I ate Elite Lifestyle Cuisine meals [elitelifestylecuisine .com]. That taught me a lot about portion control. Most people, especially in the U.S., don’t really know what a healthy portion is. M&F: Have you ever done anything in the gym you’re particularly proud of? I wouldn’t say I’m the strongest guy in the world, but the thing I’m most proud of is sticking with it for the past 30 years or so. Being consistent over that period of time has made me a lot healthier, and it makes me feel good. Finishing a workout is so satisfying—and it never gets old.